We’re starting something new! Every Monday we’ll be delivering updates on the many TMHPR cats. These updates will be directly from our wonderful volunteers and fosters who spend their days with these loving cats and kittens. Please give us your feedback at media@takemehomepetrescue.com! 4 Kittens Make Their Debut! Our very first Monday Meow comes with an extra special announcement! 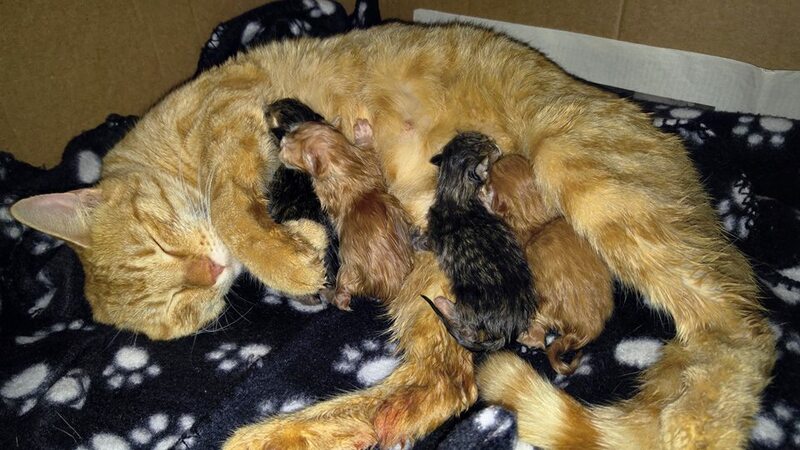 Yesterday, Loki gave birth to 4 healthy and adorable kittens! Here is a great picture of Loki and her babies. Stephanie reports that Loki is a purr machine and the kittens are very noisy! What a great mom she is already.Stephanie, Loki’s temporary foster mom, stepped up last week to care for Loki while we search for a more permanent foster home for Loki and the kittens as they grow. Thank you so much to Stephanie for giving this sweet momma cat a warm and dry place to give birth (unexpectedly early!). If you are interested in fostering Loki, PLEASE let us know as we would love to talk with you! Just fill out this form. Check out this short video clip Loki’s foster mom took within 12 hours of the kittens being born! This week we also accepted into our program a momma cat and her three kittens. 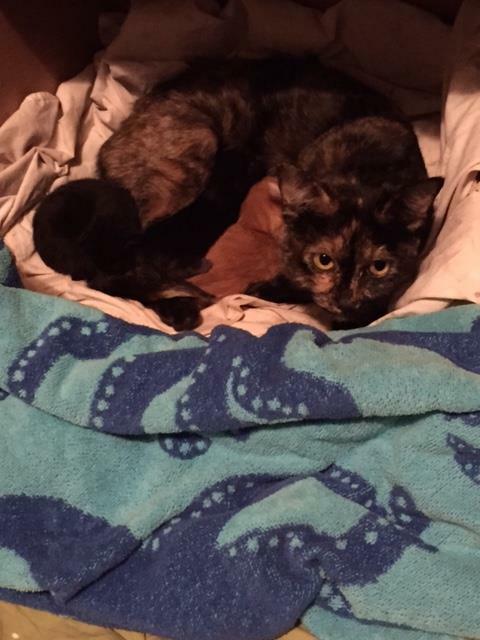 The mother’s name is Cali (she’s a gorgeous torti) and her kittens are Midnight, Buddy, and Holly! The 3 kittens are about 2 weeks old. This little family is already settled into their foster home where they will stay until they are all 4 ready for forever homes! Did you know that we are holding a blanket drive? Please consider donating new or gently used blankets and towels, we can certainly use them now that the temperatures in North Texas are dropping and the weather has been wet!What an odd time to have SO many kittens… normally you would see kittens primarily in the Spring, however lately there have been so many litters at any time of the year. Please spay or neuter your pets! This kitten was MADE to be on camera! He loves all the attention it brings and he also loves all the outfits! His foster mom reports that he is very patient with hats, jackets, and other clothing that most cats probably would not put up with. 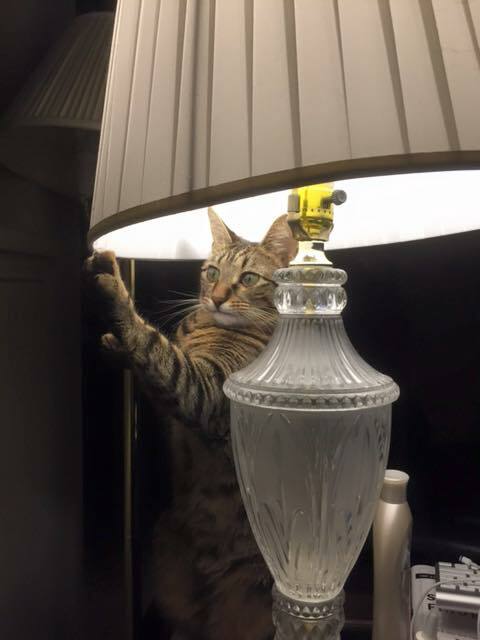 He is going to make someone a great cat some day… could that be you? 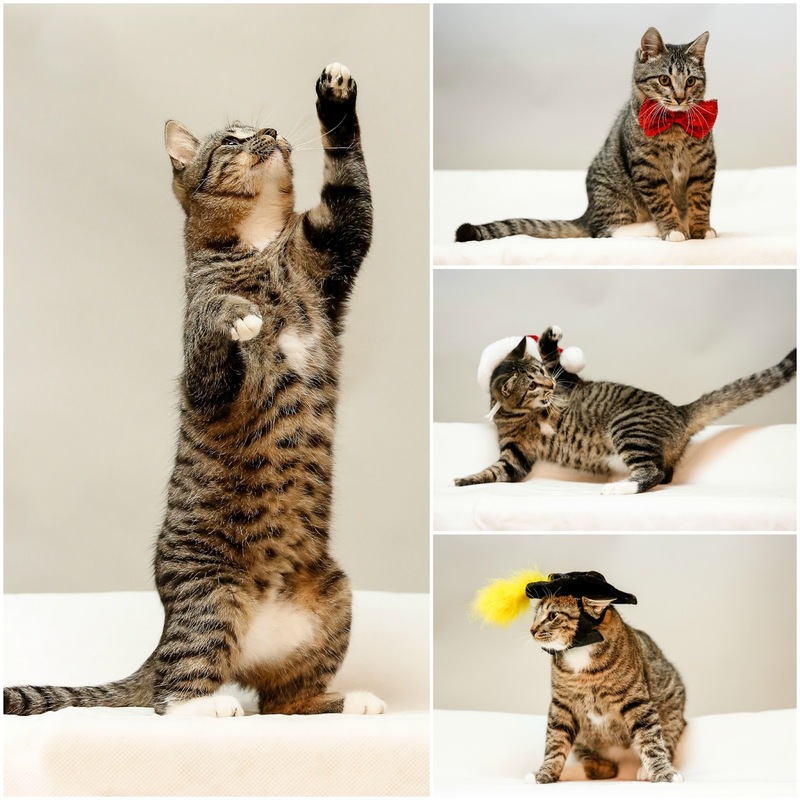 Check out his full profile and let us know if you are interested in adding this cat to your home… we promise he’ll be the life of the party! 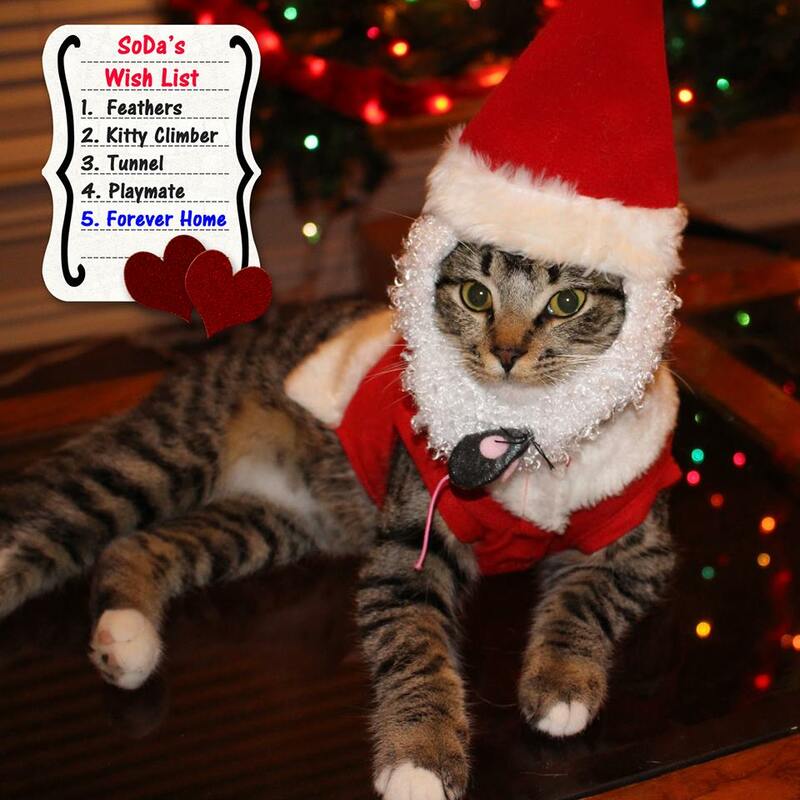 Here’s a bonus picture of SoDa trying out his Santa costume… this boy is ready for Christmas with his costume AND wish list! PS – Did you know his name is SoDa because he came from South Dallas? 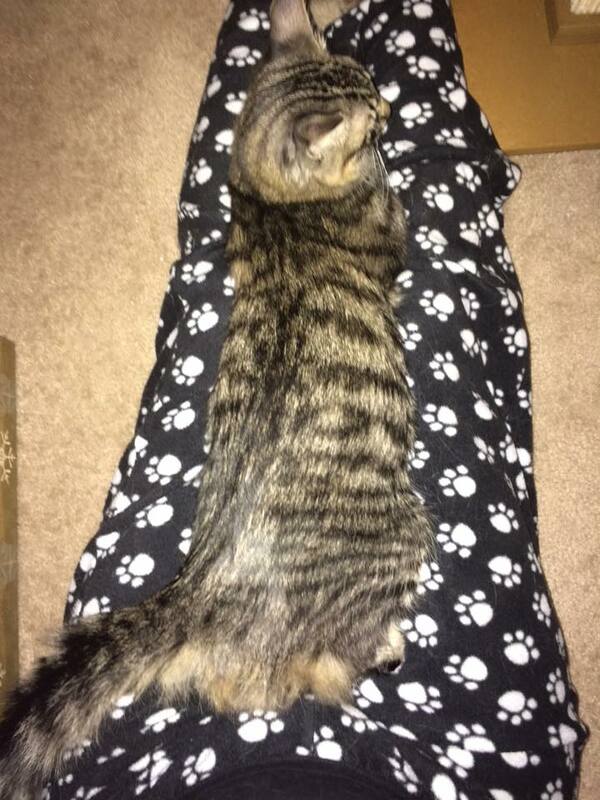 Vinny Is A Lap/Leg Cat! Sweet boy, Vinny, clearly did not want to let his foster mom do anything today except pet him and cuddle with him and his siblings! And rightfully so, we’ve been experiencing some nasty, cold, and wet weather… not that Vinny or his siblings experience any of that from their wonderful foster home! Vinny, Sammy, and Denny were all rescued from an apartment complex garage a few weeks back. The foster home they’re staying at is considered a Kitten Wonderland! They have plenty of cat trees to climb, kitty treats to eat, and toys to play with. Though soon they will like forever homes of their own of course. Here’s Vinny’s full info. Have your people contact our people if you’re interested in one of these munchkins. We can make an appointment to meet 😉 By the way, doesn’t his foster mom have the COOLEST pajama pants?? We are all jealous! Black Friday = Kitty Litter Kaper! 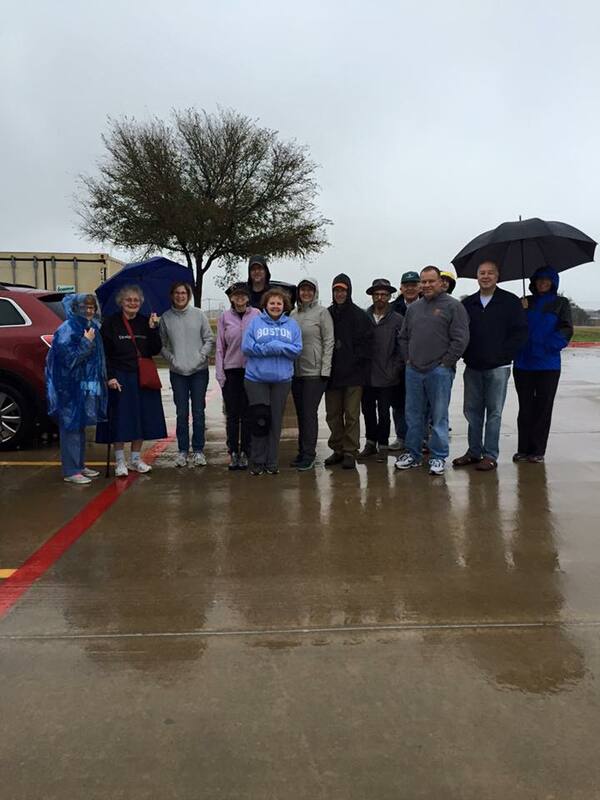 On Black Friday, a handful of our exceptional volunteers ventured into the cold and wet to transport 100 tubs of our favorite cat litter (Tidy Cats) from PetSmart to the adoption center and volunteer’s homes! A gracious donor took advantage of a Black Friday deal so we should have enough litter until next year. Thank you to our donors and those who came out to help transport tubs of kitty litter. Another great deal on kitty supplies is still going on online. This is the food we use for all of the kittens in our program, and it’s on sale for only $15.19 for a 7lb bag right now! Click here to check out the item on Amazon.com. Update from Georgia (now Sasha)! Georgia’s (nka Sasha) mom sent her former foster mom an update the other day. Georgia and her brother, Luke, were adopted the same day in January to different families…for those that do not remember. That was one very successful day for cat adoptions! Thank you all for checking out our very first Monday Meow, we hope you enjoyed the update! Please let us know if you have any comments or recommendations by emailing media@takemehomepetrescue.com. We’ll see you again next Monday!